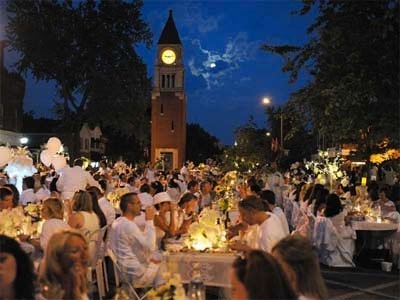 The picture-postcard-perfect town of Niagara-on-the-Lake was abuzz with shoppers and theatergoers when we arrived on a resplendent summer day. You could be very happy just strolling the streets of this upscale village, admiring homes straight out of a glossy magazine, or shopping in the chic boutiques, or dining in the many fine restaurants, or visiting the shore of Lake Ontario. But most people had come for the theater, as had we. The Shaw Festival was founded in 1962 with the mission of paying homage to the prolific British playwright George Bernard Shaw. Perhaps one motivation was to provide a counterbalance to the older Stratford Shakespeare Festival’s concentration on “The Bard of Avon,” but that’s mere conjecture on my part. The Festival’s purview was later refined to encompass plays written during Shaw’s long lifetime (1856 to 1950), although lately the bounds have been stretched a bit with the inclusion of popular musicals of more recent vintage as well as some contemporary plays. The Festival comprises four theaters, from the grand, 856-seat Festival Theatre to the compact, 200-seat Studio Theatre. All are within a short stroll of one another and the plays on offer rotate daily with frequent matinees so that during a short stay a visitor can see a good many plays. For theater of this caliber, ticket prices are surprisingly moderate and, since prices are in Canadian dollars, American visitors in 2014 will enjoy a discount of about eight percent thanks to a favorable exchange rate. 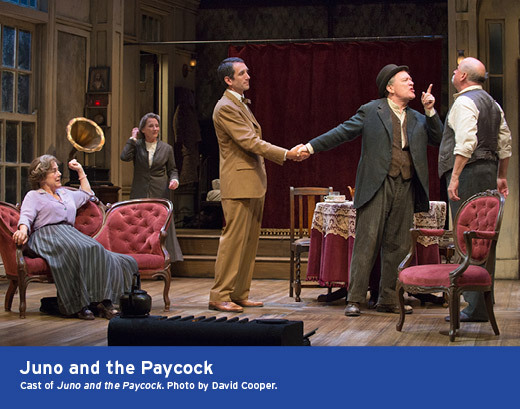 For the 2014 season, the Festival is mounting ten productions, including two by Shaw, The Philanderer and Arms and The Man. We managed three in two days during a brief layover en route to Stratford. 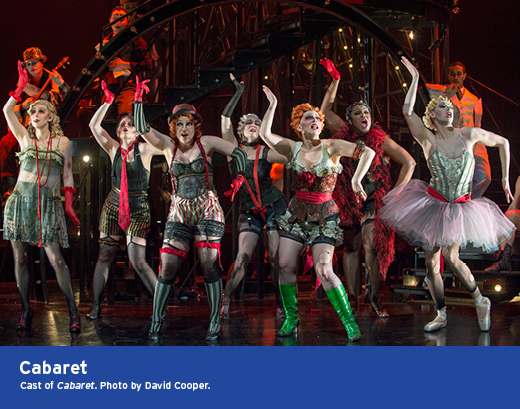 Cabaret, the Kander and Ebb smash, is getting a solid revival under the direction of Festival veteran Peter Hinton. Deborah Hay is terrific as Sally Bowles and Juan Chioran’s Emcee is very much his own, borrowing nothing from his storied predecessors in the role. Not every element of the production works as well, however, and – let’s face it – the subject matter is downright depressing. So if it’s a lighthearted musical you’re looking for, look elsewhere. Another offering on the heavy side is Sean O’Casey’s Juno and the Paycock, about the trials and tribulations of a family during Ireland’s Civil War – not the one fought against the British but the one the Irish fought against each other after winning a peace that partitioned Ireland. Not everyone thought that was a good idea then; some still don’t think so. If you thought the “dysfunctional family” was a recent invention wait until you get a load of the Boyles. Dad (the “paycock” or peacock) is a drunken braggart, son Johnny’s a shattered IRA veteran with PTSD, daughter Mary is looking for love in all the wrong places. Mother, the Juno of the title, is a tower of strength. It helps to have a grounding in the history of the period and the program notes are a must-read for those who don’t. For those who think the Irish are a hard-drinking but jolly race, this play will be an eye-opener. It’s a glimpse into the darker side of the national character, one that continues to divide families to this day. A laugh riot it ain’t and because of its length it can be heavy going for some; a good number of folks packed it in at the intermission. Those who stick it out, however, will be rewarded with some truly solid acting. Fortunately, we ended on a happier note with a blissful production of Arms and the Man, one of Shaw’s most popular plays, and deservedly so. This romantic farce requires a sense of high style to work just so and the cast, under the sure hand of Morris Panych, deliver nicely. Man (and woman) does not live by great art alone, of course, so we were glad to get an usher’s recommendation for Il Gelato di Carlotta, a few doors down from the Royal George Theatre on Queen Street. This is the best gelato I’ve had this side of Rome. It’s on the pricey side, but once you tuck in, I doubt you’ll be complaining. For dinner, we were lucky to chance upon Grill on King, which has a sidewalk seating area perfect for people watching and spotting the occasional Festival star at a nearby table. They adhere to the locavore aesthetic that seems to be de rigeur at most of Ontario’s better restaurants these days and their Village Salad, a sort of Greek salad minus the lettuce, was impeccably fresh. I succumb too often to Tagliatelle Carbonara on menus and am usually disappointed. This was the best I’ve had since a memorable meal in Chamonix in the French Alps. My wife’s mahi-mahi was also tasty, with the lightly grilled vegetables giving the fish some strong competition. The lamb shank, meltingly tender, was roundly praised by a fellow diner. Niagara-on-the-Lake is one of those ever so slightly out of the way destinations that keeps luring us off the Queen Elizabeth Way, the main route from Buffalo to Toronto. I have every expectation that it will do so again. 233 King Street, just off Queen.